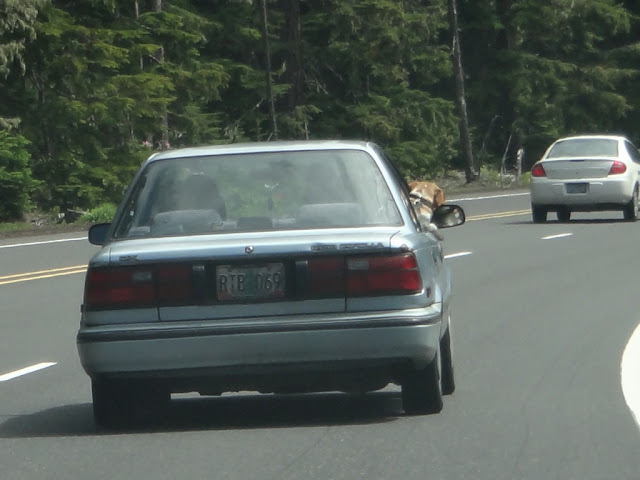 Photograph 1 - "Get out of may way" says Butch from the passenger seat in front of us. Taken near Willamette Pass, Oregon. 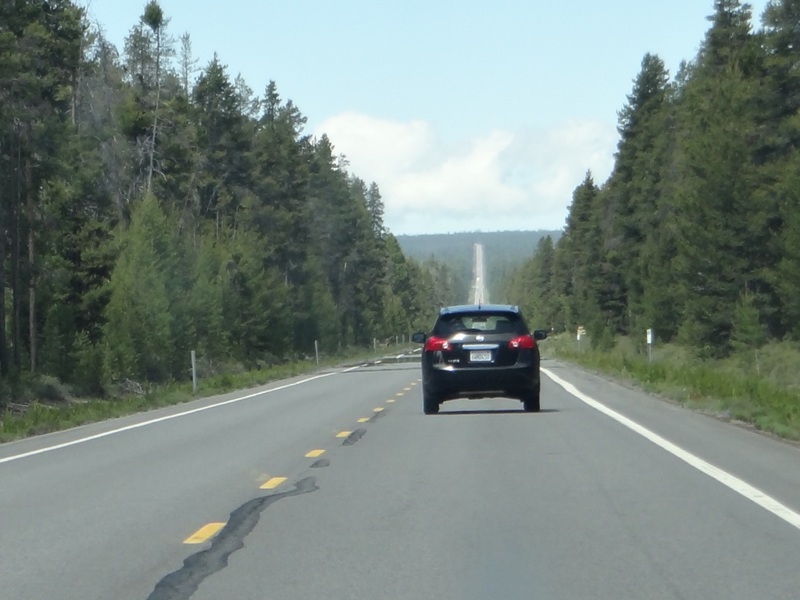 Photograph 2 - The long and winding "straight" road approaching the northern entrance to Crater National Park, Oregon. Photograph 3 - The Crater Lake, Oregon from the east rim. 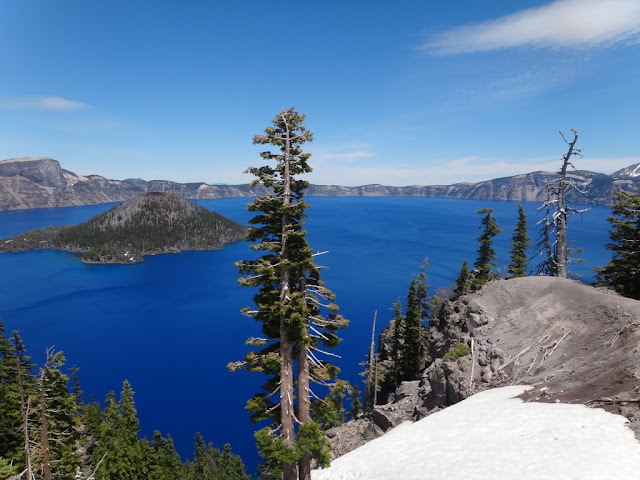 Photograph 4 - A panorama view of Crater Lake, Oregon. 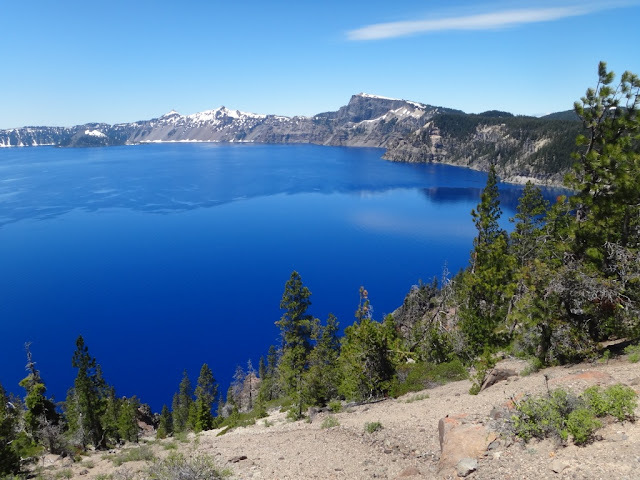 Photograph 5 - Another panorama view of Crater Lake with Connie. Photograph 6 - Crater Lake, Oregon from Pumice Rock. Photograph 7 - Yet another Crater Lake panorama view, but with Wizard Island and ice. 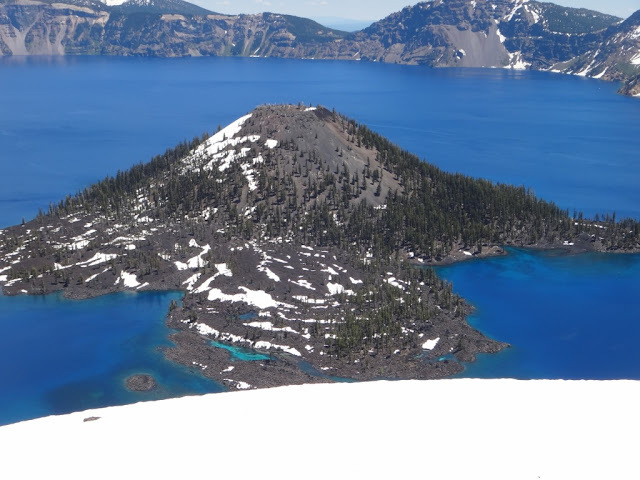 Photograph 8 - A closer view of Wizard Island, inside Crater Lake, Oregon. Photograph 9 - Just......Anne and Connie - guess where? 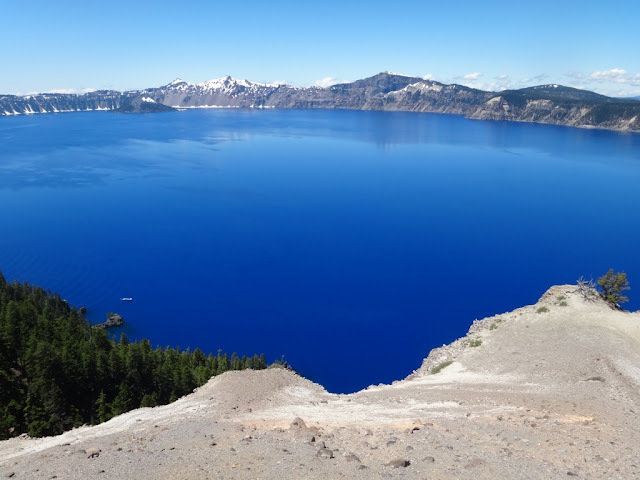 Photograph 10 - Last picture of the magnificent blue Crater Lake, Oregon. Photograph 11 - This is Mount MvLoughlin east of Medford, Oregon. 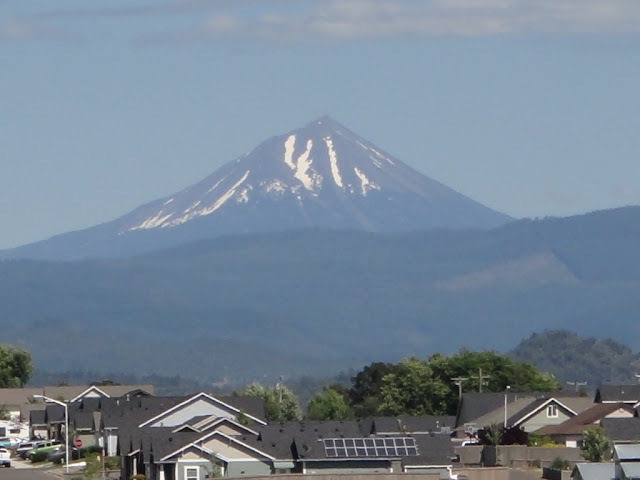 We can see this from our accommodation in Medford. 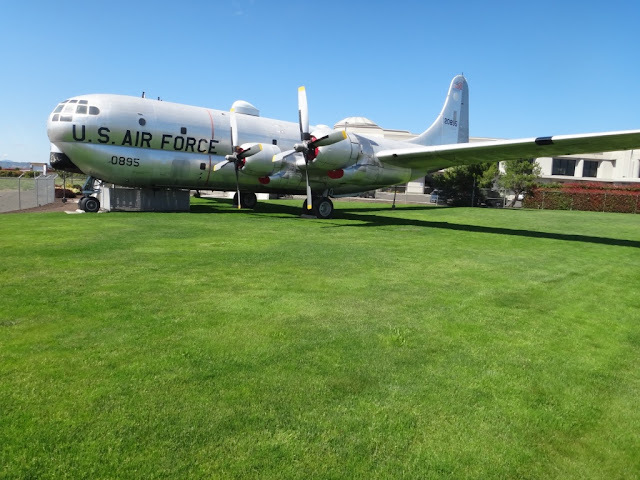 Photograph 12 - Another vintage aircraft discovery. This time at Medford Airport, Oregon. This is a KC47 Stratotanker, based on the B29 bomber. Active during the early 50's - gold! We left solemn Salem after having a free full breakfast at nearby Denny's. 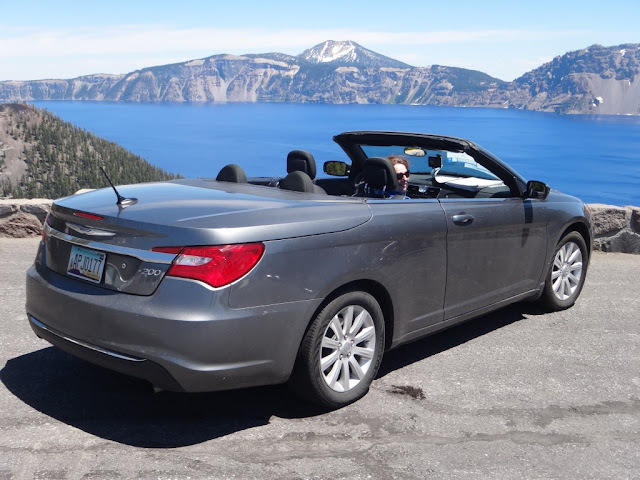 We say solemn because we experienced Salem in overcast weather however, our accommodation was excellent and the locals were great.We headed south along the I-5 towards Springfield in Oregon and turned east to the Crater Lake National Park. Once we reached the high mountain pass the skies cleared and the rest of the day was brilliant. We arrived at Crater Lake at noon and had lunch at one of the viewpoints along the rim. Now what can we say about this park. Crater Lake is very similar to the Blue Lake at Mount Gambier in South Australia. But...........the size of the Oregon version is significantly larger, is still sitting on a active volcanic site and is almost 2000 feet deep. The rim is between 500 to 2000 feet above the water. And the colour of the water is a pure sapphire blue. Apparently it blew its top 7,700 years ago and was witnessed by humans (who ever they were back then) and is Oregon's best visited site. There is an island at one end called Wizard Island with another one almost broaching the water. The views around the rim are magnificent. We just stood and soaked up the beauty of the lake from all vantage points. What makes it more grand is the ice and snow that is still abundant and of course the perfectly blue skies. We will remember this day for a long time. Our destination for tonight is Medford, still in Oregon and we have now a habit of visiting a Wal-Mart store to buy our eating "stuff" for tomorrow. As for tomorrow we have a short journey to Fortuna in California. We will be driving to the Pacific coastline and passing through the tall Redwood Forest. Only 1.5 days to Anne's birthday. Cheers.